When Robert and I travel, we like to get away from it all as much as possible. Cell phones and iPads? We leave those at home. Posh accommodations with nightly turndown service? Not our style! Reliable electricity and hot water? Don’t need it. We know we are in the right place when a flashlight is required to find our room at night. The one thing we can’t live without is access to cold beer and delicious food. Enter La Loma Jungle Lodge & Chocolate Farm. 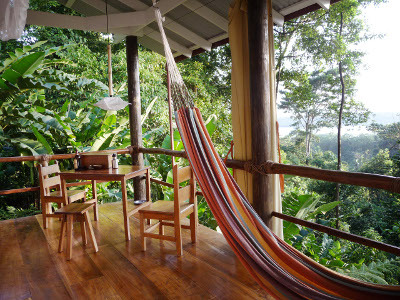 La Loma is a tiny eco-retreat and chocolate farm located on Bastimentos Island in beautiful Bocas del Toro, Panama. Accessible only by boat, La Loma is a truly remote getaway. There are only four rancho cabins, one nestled into the heart of the jungle and three perched high up in the jungle canopy where the birds and monkeys live. Those last three require a steep climb, but the views from the top are well worth the effort. Each cabin was designed with privacy and an appreciation of the natural surroundings in mind. There are no walls—that would only detract from the view. A sheer mosquito net to sleep under is all you really need. Even the shower is outside! It is clear that La Loma is a socially responsible operation. Each cabin was built by hand using naturally fallen trees and sustainably harvested lumber. Water is collected via rain catch­ment sys­tems and solar panels provide electricity. You can charge your cell phone, but only on sunny days. They have worked extensively with the indigenous Ngobe people to establish numerous community development projects, with a particular focus on improving the lives of schoolchildren in the area. Owners Henry and Margaret make you feel welcome the moment you arrive. They have gone out of their way to make La Loma special. During our stay, the hosting and cooking duties were handled by Jak and Brie who are two of the sweetest you could ever meet. La Loma guides Roger, Mr. Kelly and Chapi (whose ability to spot wildlife is unparalleled) happily accompany you on whatever excursions you may choose during your trip. It is a very community-oriented experience. We felt right at home and made fast friends with our hosts and the folks staying in the other cabins (I’m sure the impromptu rum tasting we hosted in our cabin helped with that!). Despite its remote location, La Loma is a perfect jumping off point for Bocas del Toro’s many activities. We filled our days fishing, snorkeling, hiking, and lounging on the many nearby beaches. The best activity of all was relaxing in a hammock in our cabin, letting the sounds of the surrounding jungle lull us to sleep. Because you are so isolated, all meals are provided. I normally steer clear of all-inclusive resorts, but La Loma is developing quite a reputation for its food. Much of the food served is grown on the premises, and the focus is on seasonal, sustainable ingredients. As you might expect, considering it is located on a cacao farm, chocolate is featured heavily on the menu. Your day begins with homemade muffins and a thermos of Panamanian coffee which are discreetly delivered to your cabin early in the morning. When you are finally ready to toss aside the mosquito nets and officially get out of bed, head down to the main lodge for breakfast. It is a casual, self-serve affair, typically consisting of yogurt topped with tropical fruit, homemade coconut granola, and cacao nibs, a rotating selection of freshly-baked bread with guava jam (the johnny cakes were my favorite), and fresh juice and coffee. Someone will usually offer to make you some eggs as well—perfect if you are craving some of the zingy Bocas hot sauce. Lunches were hearty and delicious. On our first day, we were served homemade tamales which were—somewhat unexpectedly—stuffed with whole, bone-in chicken legs. 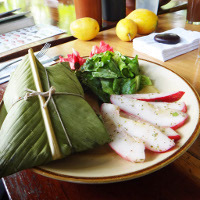 The tamales were accompanied by a savory beet relish and a beautiful mountain apple salad with hibiscus flowers. If you are planning to be out on an excursion during the day, La Loma will pack a lunch for you. The highlight of a rainy trip to the Zapatillos Islands was sitting down with our fellow travelers to a to-go lunch of white bean falafel, cabbage slaw, homemade tortillas and tahini-coconut sauce. You also get “lunch dessert” which may be spicy ginger cookies one day or guava jam thumbprints the next. Dinner at La Loma is a bit more elaborate. Served communally in the main lodge, the meal starts with a social cocktail hour allowing guests to get to know each other. After a day of fishing or sunbathing, you may have a serious hankering for a cold beer. You shouldn’t pass up the nightly cocktail, however, which is frequently made using ingredients straight from La Loma’s garden. I really enjoyed the basil gimlet and the noni fruit margarita. Once everyone gets settled, appetizers are served. Fried plantains topped with curried eggplant and chilled cucumber and chayote squash soup with red pepper oil were among my favorites of the trip. Main courses were equally delightful. Our first night, we were treated to a delicious seared tuna and rice bowl with coconut and katuk, a leafy green vegetable that is brand new to me. It tastes like peas. Knowing that we were staying on a chocolate farm, Robert was hoping for mole and he got his wish! He was right to be excited—it didn’t disappoint. The chicken was tender and the mole sauce was complex and not overly sweet (a common problem in Seattle’s Mexican restaurants). It was served with coconut rice and bele leaf, another new vegetable to me. Unsurprisingly, desserts were predominantly chocolate-based. We celebrated a fellow guest’s birthday with chocolate cake one night. Another night—Top Chef style—we had “chocolate three ways” (two truffles and a demitasse of rummy hot chocolate). Most people preferred the chocolate desserts, but I liked Brie’s “bird of paradise” best. 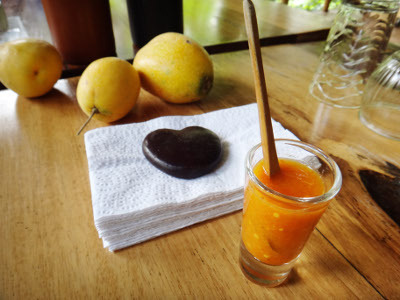 It featured many of the different tropical fruits grown in the garden such as passion fruit, jackfruit and surinam cherries, which are tart and tannic and a bit of an acquired taste. I loved them and immediately starting dreaming up all of the various cocktails I could make with them. Surinam mojito, anyone? Robert and I rarely talk about returning someplace—the list of places we want to see is just too long. But Robert has already brought up what activities he would do on this next trip to La Loma. If you love great food and beautiful surroundings (and are willing to release your grip on your cell phone for a few days) then La Loma is the perfect getaway. Robert and I recently got to experience The Willows Inn’s Fish, Forage, and Farm package. Building on the success of their acclaimed restaurant, The Willows has just started offering this all-inclusive, culinary getaway. For two nights, you get to stay in one of their seaside guest houses and learn how The Willows sources the food they serve in their famous restaurant. It is a hands-on adventure devoted to showing guests such things as sustainable farming, how to forage for wild edibles, butchery, and traditional food preservation techniques. As you might expect, you also get to eat plenty of great food prepared by Willows Inn chefs. Not long after arriving on Lummi Island, we joined our friends who would be sharing the weekend with us. We all hiked down to the beach where we were greeted by Ben and Mike, our expert guides for most of the weekend’s activities. They welcomed us with steaming bowls of clam and seaweed soup that had been warmed over an open campfire. I love anything smoky and/or briny so this soup was right up my alley. To my mind, soups like this are the ultimate comfort food: simple, clean flavors made from stunningly fresh ingredients harvested straight out of the waters in front of us. It doesn’t get much better than that. As we stood around the fire, warming up with our soup and getting acquainted, I knew we were in for a wonderful weekend. Later that day, Ben gave us a brief demo on how to butcher a venison leg. I doubt I’ll ever need to butcher a leg of any kind, but it was still very interesting seeing it done in-person and having the ability to ask questions. It brings you closer to the food you are about to eat which is the goal of the Fish, Forage, and Farm experience. Once the leg was carved, Ben ground up some of the meat using an antique meat grinder, and it became a “mix your own tartare” dish. Available toppings included dried blackberries, dried chanterelle mushrooms, juniper oil, horseradish and pine salt. We were instructed to grab a helping of venison, garnish it to our liking, and eat it with freshly grilled flatbread. Tartare isn’t something I would normally go for, but the experience was so much fun. I loved the DIY aspect. As nice as it is to sit down for a gourmet meal with friends, I sometimes enjoy standing around and eating casually like this even more. We ate so much great food over the weekend, it would be impossible to cover it all. Highlights for me included a young kale salad with croutons that had been cleverly fused together with anchovies, beef marrow with razor clams, wilted chard, and Olympia oysters (which I helped shuck! ), a mixed grain breakfast porridge with stewed blueberries and–my favorite dish of the trip–simple grilled oysters with brown butter and wild capers. I was a bit leery of oysters before this weekend, but now I’m officially sold. Last but not least, I absolutely fell in love with the fantastic sourdough bread made by Isaac, another member of the Willows Inn team. It has inspired me to try my hand at sourdough bread again. In fact, I was inspired by many things during our Fish, Forage, and Farm weekend. As much as I love discovering new, unusual ethnic cuisines and ingredients, the food available in my own backyard is pretty hard to beat. Now that I’ve learned how to shuck my own oysters, I’m excited to tackle that at home sometime. And next time we backpack at Toleak Point, I may just whip up an impromptu seaweed salad. The overall experience was unforgettable, and I am so happy to have been able to share it with good friends. Thanks to Ben, Mike, and Isaac for the wonderful food and thanks to Jason for inviting us on this adventure! Robert and I spent the second part of our vacation in New York City. New York City has a reputation for being home to just about any type of food or cuisine you can imagine. Although DC had a few surprises, most of it was food we had seen before. In New York, we made a point of seeking out unusual ethnic cuisines and classic New York foods. We wanted to find things we knew we wouldn’t be able to get back home in Seattle. A visit to New York wouldn’t be complete without sampling some pizza. Though wood oven pizza has recently surged in popularity, if you want classic New York style pizza, you should visit a coal oven pizzeria. There are only a handful of coal oven pizzerias in Manhattan, and most of them are very old. We decided to check out John’s of Bleeker Street, a well-respected pizza joint located in the West Village. John’s has been serving up thin-crust, coal oven pies since 1929. With its well-worn wooden booths and red checkered tablecloths, John’s epitomizes an old-school pizzeria. We split a sausage and green pepper pizza. The toppings were fresh, and the pizza wasn’t overloaded with cheese which we appreciated. The crust–arguably the most important part of any pizza–was crunchy, chewy and slightly smoky. It is a shame that coal ovens are so rare; the subtle difference in flavor was a treat. Since Seattle doesn’t have any real celebrity chefs, we thought it would be fun to splurge on a dinner at one of Manhattan’s famous restaurants. After a little debate, we finally chose Babbo, Mario Batali’s classic Italian eatery. I’ve always liked Mario’s recipes, and Babbo seemed like a good fit for us–upscale but unpretentious. We started off with an arugula salad and the lamb’s tongue vinaigrette with mushrooms and a poached egg. Lamb’s tongue isn’t something I would normally order, but it was an excellent dish. For our entrees, we tried two pastas: beef cheeks ravioli which was rich & meaty and the rock shrimp & green chili spaghetti which was spicy & briny, if a bit oily. We cleansed our palates with an assortment of gelati (the green apple was amazing!). So, did Babbo live up to the hype? Yes and no. The meal was great, but probably not for the price, especially considering how much other fantastic food we ate elsewhere in New York at a much lower cost. Have you ever heard of soup dumplings? I hadn’t until I visited New York. Now they are one of my favorite foods. Officially known as Xiao Long Bao–sometimes shortened to XLB’s–these Chinese dumplings are filled with a pork meatball and a savory broth (the “soup”). We went out for soup dumplings twice at Shanghai Café Deluxe, which is widely regarded as having some of the best dumplings in the city. Our waitress could tell we were newbies and graciously showed us how to properly eat the dumplings. You hold the dumpling in a large spoon and nibble a little hole near the top to let the steam escape; then you can either slurp the soup out slowly or wait until it cools and eat the dumpling in one bite. Despite the lesson, I still managed to burn my mouth and spill soup down my shirt. The dumplings were so good, I didn’t even care. At $5 per order, soup dumplings are seriously good cheap eats. Now that I’ve had them, I’m not sure I’ll be able to live without them. Smoked salmon is ubiquitous in Seattle, but we don’t have great lox and we certainly don’t have a smoked fish emporium like Russ & Daughters. Russ & Daughters has been selling smoked fish delicacies to New York residents since 1914. We headed there early one morning craving the most traditional of all New York breakfasts: bagel and lox. I felt like a kid in a candy store at Russ & Daughters. Smoked sable, pickled herring, chubs, they have it all! For a smoked fish lover like me, the choices were truly overwhelming. The kind gentleman working behind the counter could tell we were tourists, and he patiently walked us through our order. 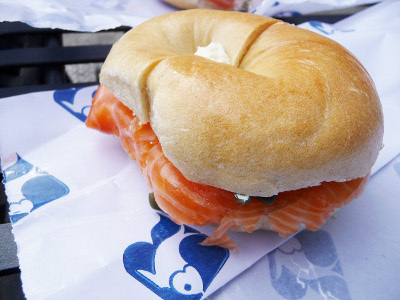 We each opted for plain bagels with cream cheese and their most popular lox: Norwegian Salmon. The lox was unlike any I’d had before. It literally melted in your mouth. The secret is in how they cut it. A perfect cut keeps it from being mushy or chewy. I can’t think of a better way to start the day than with a bagel and lox from Russ & Daughters. Most Thai restaurants in Seattle feature the same limited menu of overly sweet curries and noodle dishes, completely ignoring all of the amazing regional cuisine that Thailand has to offer. I would love for Seattle to get a really great Thai restaurant that showcases some of Thailand’s less famous dishes and isn’t afraid to use exotic ingredients like fermented shrimp paste. The East Village’s Zabb Elee is a perfect example. Zabb Elee serves Issan cuisine which comes from Northeastern Thailand and borrows heavily from neighboring Laos. Issan dishes tend to be sour, salty and very spicy even by Thai standards. Sugar and coconut milk are used infrequently–you won’t find pad thai or coconut curry on the menu at an Issan restaurant. At Zabb Elee, we ordered one of the green papaya salads (they have seven kinds on the menu! ), crispy fried catfish with tamarind sauce, and a side of sticky rice. Everything was good, but I especially loved the green papaya salad. It tasted very fresh and had that perfect balance between salty, sweet, sour and spicy that good Thai dishes strive for (it might have veered a bit heavier toward the spicy, but that’s no problem for me). Portland has Pok Pok, and New York has Zabb Elee–it is time for Seattle to get it’s own standout Thai restaurant. Something else that is missing in Seattle are Halal carts. Halal carts are everywhere in Manhattan. Originally catering to hungry cab drivers, New York’s Halal carts are now extremely popular with midtown workers, tourists and late night drunks. 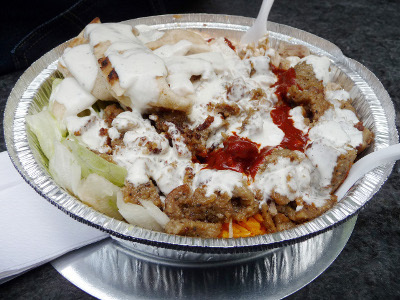 After working up an appetite fighting the crowds at Moma, we decided to grab lunch from the Famous Halal Guys at 53rd and 6th. We split their combo platter which is comprised of turmeric rice, chopped lettuce, diced grilled chicken, gyro lamb, and pitas. This is generously drizzled with their signature white sauce and a spicy red sauce. The food was oily but delicious! The combination of cooling, tangy white sauce and hot sauce really made this dish for me. There is nothing fancy or complicated about this food. It is comforting, tasty and cheap–exactly what food from a street cart should be. Food trucks are relatively new in Seattle so perhaps it is just a matter of time before we get our first Halal Cart. One can only hope. After falling in love with the gua bao at Chino’s, I couldn’t pass up an opportunity to try the famous pork belly buns at Momofuku. David Chang, chef and mastermind of the ever expanding Momofuku empire, has been credited with bringing pork belly buns to the forefront. Pork belly buns are showing up everywhere these days, but Chang’s are still rated among the best. We headed out for dinner at Momofuku Ssam Bar, a casual, bustling eatery featuring modern twists on Asian cuisine. Momofuku’s cocktail menu had some interesting choices. I was immediately drawn to the McKenzie Shrub made with rye, cocchi americano, pomegranate, and coconut vinegar. I love any cocktail that contains vinegar. We split an order of the pork belly buns and a seasonal pickle & kimchi platter. The pork buns lived up to the hype without question. They were fatty, salty, rich and delicious. Some restaurants go too light on the meat. Not so at Momofuku. These buns were stuffed with giant slabs of roasted pork belly and adorned simply with cucumbers, scallions and a touch of hoisin sauce. Between the pork belly buns, the unusual pickles, and the intriguing cocktail specials, Momofuku Ssam Bar is my kind of restaurant. The most exotic food we ate in New York was at Xi’an Famous Foods. Xi’an is an ancient city in central China with its own unique cuisine. Noodles and dumplings dominate Xi’an cuisine. Due to the large Hui community, Muslim food is also common. In some ways, it is a blend of Chinese and Middle Eastern food. Xi’an Famous Foods is most well-known for their exotic lamb face salad. Not a fan of face, I chose a somewhat tamer order of cumin lamb hand-ripped noodles. Cumin isn’t a spice normally associated with Chinese cuisine, and my noodles were indeed strangely reminiscent of Mexican food. The springy, spongy hand-ripped noodles made an ideal base for the spicy, flavorful lamb. Robert ordered the spicy and tingly lamb leg salad. Emphasis on the tingly. This dish contains so much Sichuan peppercorn that it almost has a menthol flavor. If I wasn’t already familiar with the mouth numbing qualities of Sichuan peppercorns, I might have thought we were poisoned. I liked the mix of flavors in this dish but thought it could have been improved by adding more vegetables and maybe some noodles. It was a bit too heavy on the meat. Still, when you’re paying $7 a pop for such exotic foods, there isn’t much to complain about. It might be famous and touristy but Katz’s Delicatessen is also damn good! Your first visit to Katz’s can be disorienting. Over the last 124 years, a ritual for ordering has been established. Grab a meal ticket upon entry, wait in a line to order your sandwich, tip your sandwich maker a buck, and he’ll offer a delicious slice of deli meat for you to nibble on while he finishes making your sandwich. 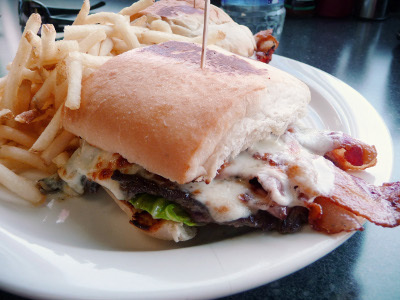 Grab a table and then sit back and enjoy one of the best sandwiches in the city. 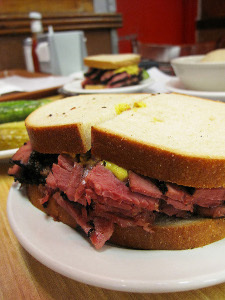 There are many sandwiches on the menu, but we were here for one thing: the famous pastrami on rye. Robert ordered a whole sandwich, and I chose a half sandwich with a bowl of matzo ball soup. It was undeniably great. The pastrami was succulent and peppery. Sandwiches at Katz’s are piled ridiculously high with meat–they are impossible to eat politely so don’t even try. A common complaint is that there aren’t any good New York style delis on the West Coast, and I think I get it now. There certainly isn’t anything like Katz’s. I thought Seattle had the market cornered when it comes to unusual ice cream flavors, whether it’s salted licorice ice cream from Molly Moon’s or the Elysian Stout ice cream at Bluebird. I was pleased to discover that New York has its own collection of wacky ice creams. At Momofuku Milk Bar, I couldn’t resist trying the cereal milk soft serve. Remember when you were a kid and you would drink the leftover milk at the bottom of your bowl of cereal bowl because it tasted so good? That’s the concept behind this dessert. They make it by steeping milk with caramelized corn flakes, straining it and then turning it into soft serve. This is served in cones and topped with additional corn flakes. It was milky, sweet and a bit salty. It’s a comforting dessert that reminds you of childhood. At Big Gay Ice Cream, cones come in suggestive shapes and are named things like Salty Pimp. I tried the choinkwich, an ice cream sandwich made of chocolate ice cream sandwiched between two chocolate cookies that have been smeared with bacon marmalade. The bacon layer was thin but added just the perfect hint of salty, smoky flavor–a nice pairing with the rich chocolate cookies. I may need to pick up a jar of bacon jam from Skillet so I can make my own choinkwiches this summer. I had high hopes for the food in New York, and I am happy to say that it exceeded those expectations. One of the greatest pleasures in traveling is getting to sample foods you can’t back home. Unfortunately, when you fall in love with these foods, it can make coming home that much harder! Robert and I just returned from a fantastic vacation to Washington, DC and New York City. I had never been to either place before so I was determined to soak up as much city life as possible. Naturally, my biggest priority would be to check out the local food & drink scene. Our first stop on the agenda was Washington, DC. We stayed at a small B&B in Dupont Circle where many of the city’s great bars and restaurants are located. Here is a roundup of where we ate and drank. Rainy weather and a late arrival kept us from wanting to stray too far from the B&B our first night in town. Lucky for us, St. Arnold’s was just a few short blocks away. This bustling, old-world style pub specializes in mussels and Belgian beer. We couldn’t pass up an order of their signature mussels which are steamed with beer, caramelized shallots, thyme and duck fat. Yep, duck fat. They were rich and delicious–a comforting treat for two weary travelers. Note: if you come during happy hour, mussels are half off! 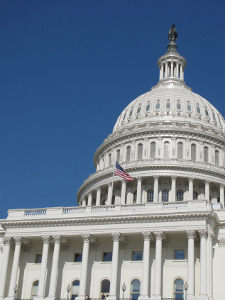 The National Mall is huge so a morning of museum and monument hopping is guaranteed to leave you famished. Unfortunately, good lunch options are limited in this area. If you happen to be near the Capitol Building, I recommend trekking down to Market Lunch located inside the Eastern Market. Market Lunch is something of an institution in DC. They are known for their crab cakes and blueberry pancakes. 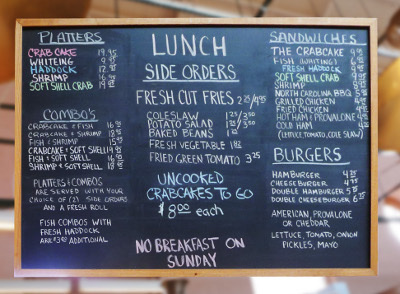 We opted for the crab cake & soft shell crab combo which comes with two sides (Market Lunch owner, Tom Glasgow, steered us toward the coleslaw and fried green tomatoes). Comprised of little more than solid chunks of sweet, flavorful crab meat, the crab cake lived up to its reputation. I enjoyed the fried green tomatoes most–they were perfectly fried and had a pleasant lemony flavor. Market Lunch is cash only. Lines can be long so be prepared to wait if you come during the lunch rush. For dinner on our second night, we headed to Churchkey, a beer bar located in the Logan Circle area. The place was packed when we arrived, but we somehow managed to snag a table. I was overwhelmed by the monstrous beer list but finally settled on the DC Brau “Public” Pale Ale–when in doubt, might as well go with something local. The dinner menu at Churchkey surprised me–you don’t see ramps and house-made kimchi on the menu at many beer bars. We split a prosciutto and fig flat bread which was tasty, if a bit too sweet. I loved the grilled Caesar salad I ordered. Smoky grilled romaine hearts topped with white anchovies and crispy garlic twists–yum! I’m a sucker for grilled salads. In search of a good spot for an after-dinner drink, we decided to check out Black Jack in Logan Circle. This dark cocktail lounge is known for their intriguing specialty cocktails (mezcal with smoked peach ice and charcuterie anyone?). Their spirits list is equally impressive. I went with a classic Sazerac and Robert sampled High West’s Silver Oat, one of the many new unaged “white dog” whiskeys currently on the market (unlike most, this one is actually good!). Black Jack is a great spot for anyone who likes unusual cocktails or is looking for a little something to sip neat. If drinking at a bar isn’t entertaining enough for you, Black Jack has two bocce courts (with stadium seating!) in the back room. One night, we were looking for a quick meal on the go so we headed to Julia’s Empanadas. Julia’s Empanadas are cheap, filling and tasty. This place is very popular with the late night drinking crowd. The empanadas we tried were delicious while sober so I imagine they must taste phenomenal after a night of drinking. We sampled the Jamaican, Chorizo & Black Bean, and the Salteña which is filled with chicken, potato, peas, raisins, and green olives. The Salteña was our favorite. It reminded me of a cross between chicken pot pie and a samosa–very spicy and very comforting. Hotel bars might not be your top choice when looking for places to drink, but the bar at Tabard Inn is worth a visit. Located inside of a small Victorian hotel, the Tabard Inn bar is a charming spot for a nightcap. We didn’t sit in the bar itself, opting instead for a cozy fireside couch in the lounge area just off the lobby. Tabard Inn mixologist, Chantal Tseng, has designed a lovely cocktail menu. Cocktails veer toward the classic but with some unique twists. Her Franco-Amero Digestif, made with rye whiskey, bitters and a brandied apricot, proved to be a perfect post-dinner treat. Feeling adventurous, we decided to take the metro up to Fast Gourmet in the U Street/Shaw area. Fast Gourmet offers delicious sandwiches and salads in an unexpected location: a gas station. The food is eclectic with a strong Latin American bent. We split the Chivito, a Uruguayan sandwich filled with–bear with me now–beef tenderloin, black forest ham, bacon, mozzarella, hard-boiled egg, mayonnaise, lettuce, tomato, green olives and pepper and mushroom escabeche. Oh, and it comes with a side of fries too. At $13, the Chivito is a pricey sandwich, but you really shouldn’t eat a whole one by yourself. We split it and were full for the next day and a half. It was worth it! This is one seriously good sandwich (the best bites are the ones with green olives). Don’t let the location scare you off. The food at Fast Gourmet is great, and eating in a gas station can be entertaining–we ate our Chivito while watching a guy replace someone’s busted windshield! For dinner our last night, we headed to another Dupont Circle favorite: Hank’s Oyster Bar. Here, we selected a light meal of oysters on the half shell (we stuck with East Coast varieties only to keep things local) and a spring vegetable salad featuring thinly sliced asparagus, haricot verts and radishes over watercress and arugula. It was a very refreshing meal–much needed after the Chivito we had gobbled earlier in the day. My crisp, slightly smoky vodka & Ardbeg cocktail was an ideal pairing for the briny oysters. Our favorite of the bars we visited was The Passenger which is located in a slightly off the beaten path area near the convention center. With Fernet Branca on tap and cocktail specials all named after Billy Idol songs, The Passenger may seem gimmicky at first glance. Still, owner Tom Brown knows his stuff and is happy to fix you a custom cocktail tailored to your specific flavor preferences. Tom saw us eyeballing a bottle of Corsair Triple Smoke Whiskey on the shelf and graciously poured free shots for us to try. Excellent service! The Passenger is casual, often crowded and might play too much 80’s music for some. If you prefer a quieter cocktail experience, head to the back room where you will find Tom’s brother, Derek, whipping up fancy cocktails in a more intimate setting (reservations recommended). DC isn’t really known as a food city so I wasn’t expecting to eat as well as I did, especially on our budget. I would have loved to try DC hotspots Rasika, Komi, and Little Serow, but they are a little outside of my price range. Nothing that I ate was particularly unusual or mind-blowing, other than perhaps the Chivito, which I had never heard of before and am now on a mission to recreate at home. Still, DC’s food scene greatly exceeded my expectations. Stay tuned for my New York restaurant report. 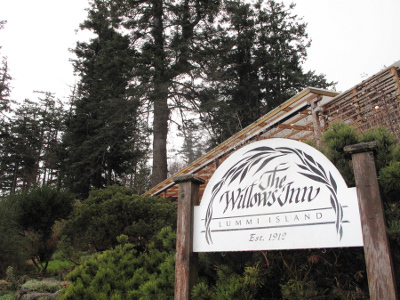 Last weekend, I had the opportunity to dine at the Willows Inn on Lummi Island. The Willows Inn restaurant has been receiving nonstop accolades ever since Blaine Wetzel took over as head chef in 2010. The New York Times declared it one of ten restaurants worth a plane ride. Chef Wetzel, who is only in his mid-twenties, is widely regarded as a rising star in the American culinary scene. He was trained at the renowned Noma restaurant in Copenhagen which many say is the best restaurant in the world. At Willows Inn, Wetzel has combined his expert training with a near-obsessive focus on local, seasonal ingredients—with very few exceptions, everything served at the restaurant is foraged or grown on the island or very close by. Buzz like this is hard for a food fanatic like me to ignore–it was finally time to give Willows Inn a try. Lummi Island is located about two hours north of Seattle. To get there, head north on I-5 to the Gooseberry Point ferry dock near Bellingham. For the best views, take scenic Chuckanut Drive (be sure to stop by Taylor Shellfish Farms on the way for a picnic lunch of fresh oysters). A brief but thrilling ride on the Whatcom Chief Ferry takes you across the bay to Lummi Island (note: the ferry is tiny & open to the elements–keep your windows rolled up to avoid getting hit with sea spray!). From the ferry dock, Willows Inn is just a short drive north around the tip of the island. You will be treated along the way to amazing views of the water, mountains and neighboring Orcas Island. After checking into our suite a few miles down the road, we headed back to the main building for pre-dinner cocktails. The bar at Willows Inn is cozy and cute with limited seating. You can hang out there or do what most people do and take your drinks into the main lobby/living room/social area. Here you will find a crackling fireplace and a fantastic view of the water. Guests mingle with drinks in hand, anxiously waiting to be called in for dinner. The excitement in the air is palpable, and it gains in intensity as the dinner hour approaches. Sipping my Boulevardier Cocktail by the fire, chatting with friends, and looking out on the beautiful scenery–I was already having such a good time, if dinner ended up being a disappointment, I almost wouldn’t have minded. Of course, it wasn’t. Immediately upon being seated, we were welcomed with champagne flutes of hard cider from nearby Friday Harbor. This cider was unlike any I’d had before—it was incredibly light and effervescent making it a great match for the food we were about to have. Moments later, the snacks started arriving, brought out to the table by the various chefs responsible for cooking the meal. Technically, dinner at the Willows Inn is five courses. However, you are provided with so many additional small bites, that the meal seems never-ending. We were served twenty separate treats throughout the evening. Early highlights included a crisp potato chip topped with homemade sauerkraut and buttery black cod and a kale “toast” with roasted porcini mushrooms and rye bread crumbs. A tiny cube of seared venison heart seasoned with red currant and rose was a delicious surprise. Naturally, given the setting, we were served smoked salmon. As expected, it was the best I’ve ever had—delicate, tender, smoky, and a bit sweet. Entrees included hearty whole grains dressed in an impossibly green puree evocative of fresh grass in the springtime. This was topped with slices of geoduck which the chef oh-so-casually informed us had been “alive three seconds ago”. A nettle and fiddlehead fern salad was garnished with cheese so fresh that it was practically quivering. My favorite of the entrees was a seared steelhead trout garnished with foraged sea beans and house-pickled capers. The richness of the fish was nicely balanced by the briny sea beans and capers. Desserts were equally exquisite. Sweet and tart rose hip ice cream was followed by a cheese and venison prosciutto plate and a bite-sized caramel with flax seeds. The most exciting dessert was the gin candy! It was like a boozy, piney after dinner mint. My dinner at the Willows Inn was one of the top five dining experiences of my life. You leave the restaurant with such a strong sense of what the island has to offer. Throughout the entire meal, the forest and the sea are front and center. A meal like this just wouldn’t be the same in the city. There is something about being surrounded by the things that you are eating that makes it taste so much better. As I was exploring the island the next day, I kept having different taste memories from the meal. A whiff of the briny sea reminded me of the pickled oysters with sorrel I’d just had. Stepping over a mound of damp, mossy earth, I couldn’t help but think of the earthy shiitake mushrooms, perfectly grilled and adorned with nothing but sea salt. Dining at the Willows Inn is not cheap. You also have to factor in the cost of a ferry trip and a room on the island (believe me; you won’t want to have to drive back to Seattle after this meal). I could try and tell you that it is worth every penny, but that really depends on who you are and how far you are willing to go for a great meal. To my mind, the adventure and the meal is worth the cost, but it’s not something I’ll be able to do again any time soon. If you are looking to treat yourself to something unique and local and don’t mind splurging, then dinner at Willows Inn is worth checking out. When I strike it rich one day, I know where I’ll be celebrating! Robert and I just returned from another wonderful trip to Santa Fe, New Mexico. We had some outstanding fall weather while we were there—sunny and warm nearly every day. The wonderful October days were perfect for zipping around town in Robert’s mom’s beautifully restored 1972 VW Bug. 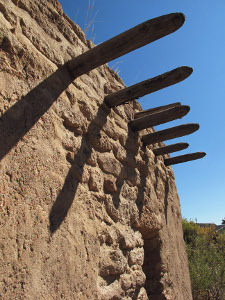 We took advantage of the nice weather by taking a side trip to see the ancient cliff dwellings at Bandelier National Monument. They are awe-inspiring, and I highly recommend a visit if you are ever in the area. As usual, there was plenty of delicious food to be had in Santa Fe. One night in particular stands out with dinner at The Shed followed by cocktails at the Secreto Bar & Loggia. The Shed’s menu consists of New Mexico standbys such as tacos, burritos and blue corn enchiladas. Of course, since this is New Mexico, you can order anything on the menu red, green or “Christmas-style” (for the uninitiated, that means with red chili, green chili or a little of each). Since I can’t go to The Shed on any old weekend, I was happy to see that they offer combo plates which allow you to sample several different items. I ordered one red enchilada (The Shed’s specialty) and one turkey sausage taco smothered in green chili. I am not lying when I say that this was the best enchilada I have ever had! Most enchiladas are made with a milder, tomato-y red sauce but The Shed’s red is all about the chili—smoky and spicy and perfect! The green was amazing too, and my taco was literally drowning in it. I would have licked my plate clean. Fortunately, The Shed provides each table with garlic bread for sopping up the chili—it may not be traditional, but you certainly don’t want any of that delicious chili to go to waste. After dinner, we headed across the plaza to the Secreto Bar & Loggia at the St. Francis Hotel. There, we met up with Robert’s friend Natalie of The Liquid Muse. Natalie is a cocktail authority so we trusted that she had directed us to the hippest sipping spot in Santa Fe. As expected, we were in good hands with expert mixologist Chris Milligan behind the bar. Serious mixologists are popping up all over Seattle these days, but I did not anticipate finding one in Santa Fe! We grabbed a couple of seats at the bar and chatted with Chris about our favorite liquors and flavors. He worked his mixologist magic and produced a series of amazing cocktails suited exactly to my tastes. I started off with a cocktail based on rum and house-made falernum. Falernum is a spiced rum made with any number of ingredients but most commonly with almond, vanilla, allspice, clove and lime. Quality falernum isn’t readily available in stores so many bartenders make their own. It lends a spicy, sweet flavor to drinks and the cocktail Chris made for me was no exception. It was a perfect drink for sipping by the fire on a chilly evening—a little reminder that the holidays are not far off. As intrigued as I was by the house-made falernum, it doesn’t compare to my level of curiosity upon spying a bottle labeled “choke shrub.” Robert’s mom makes choke cherry jam every year so I knew that choke cherries were a popular fruit in New Mexico. But what on earth is a shrub? Well, it turns out that a shrub is a tart and sweet vinegar-based syrup made most often using fresh berries. Noting my interest, Chris whipped up another cocktail for me using anejo tequila, choke shrub, mole bitters and fresh sage leaves. It sounds odd, but it was really delicious. Fittingly, it tasted like the desert! This drink is actually going to be featured in an upcoming edition of New Mexico Magazine as part of their holiday drinks special. How exciting, getting a sneak peek at a new cocktail! If you ever find yourself in Santa Fe and love creative, well-prepared cocktails as much as I do, be sure to visit Chris at the Secreto. As we stumbled out into the cold autumn night, with the smell of piñon in the air all around us and a stomach full of spicy chili and amazing cocktails, I couldn’t imagine being any happier. After a few days in Tulum, Robert and I headed south to the sleepy village of Xcalak. 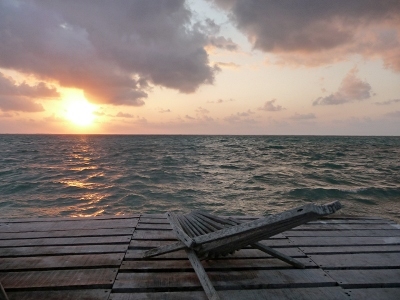 Just north of the Belize border, Xcalak is slowly being discovered as an ecological tourist destination. The second largest barrier reef in the world sits just offshore making Xcalak an ideal spot for fishing, scuba diving and snorkeling. This pristine area has been designated a Mexican national park. Despite its beauty and recreation opportunities, environmental restrictions limit development in this area so it is unlikely Xcalak will ever experience the large scale tourism of such places as Playa del Carmen and Tulum. There also isn’t much beach in Xcalak (the barrier reef keeps the waters around Xcalak fairly still). If you like long, sandy beaches and crashing waves, stick with the more populous northern Yucatan. If, on the other hand, your idea of fun includes chilling out in a hammock surrounded by unspoiled wilderness and the clearest turquoise water you’ve ever seen, then Xcalak might just be the place for you! It takes about three hours to get from Tulum to Xcalak. The drive is long, but enjoyable. At times, it feels as if you are in the middle of nowhere; nothing but green jungle for miles and miles. We even spotted a jaguar with cubs on the side of the road! We stayed at a cute, four-room hotel called Casa Carolina. The owners, Bob and Caroline, are lots of fun. Caroline makes delicious muffins for breakfast every day, and Bob will entertain you with stories and his magical margaritas in the afternoons. They are very helpful in arranging any tours or activities you may be interested in. We took a boat tour one day to Chetumal Bay and Bird Island, home to a wide variety of nesting birds. We snorkeled among the coral heads near the reef, kayaked, biked and spent plenty of time relaxing. We also met the most wonderful group of people during our trip. We became fast friends with the other guests staying at Casa Carolina and would meet up with them for breakfast in the morning and again for drinks in the afternoon. It was like summer camp. Another surprise was all of the fantastic food! Unlikely as it seems, a small foodie movement is sprouting in Xcalak. Delicious food in the middle of the jungle – could there be a more perfect vacation for me? The biggest surprise was Porfirio’s Clubhouse. I do plenty of restaurant research before any vacation, but this place did not show up on my radar. The Clubhouse highlights organic, locally sourced ingredients. It is open Sunday through Tuesday only and is located 9 kilometers up the beach road from Xcalak (look for the sign with the skull and cross bones). The Clubhouse has a great ambiance. It is dark and intimate with only five tables and a few more seats at the bar. It seems fancy at first, but this is Xcalak so of course there was a dog running around the restaurant and another perched on top of the bar. We started off with the Tortilla Española and a delicious heirloom tomato and goat cheese napoleon. For our entrée, we split the Paella Yucateca, a delectable dish of rice and locally caught shrimp. Delicious food aside, the most exciting part of the meal was the mescal tasting! The owners, Jamison and Jennifer, have collected a variety of fine mescals from the Oaxaca Valley. I was served three samples. First up, tobalá: a small batch mescal made from wild agave that is distilled as soon as it’s picked to preserve its fresh flavor. It tasted like new bicycle tires, in a good way. Next, I sampled a pechuga. This unusual mescal is distilled with fruit and a raw turkey breast. Yep, raw turkey breast (hey, it’s better than a worm…I think). The turkey breast is said to give the mescal a richer mouth feel. We joked with Jamison that it tasted like Thanksgiving. Finally, I tried an añejo which had been aged for seven years. I liked this one the best; it tasted like a fine scotch. I’m going on the record with a prediction that mescal is going to be the next big thing. It didn’t take long for our next surprise to arrive. While we were relaxing and enjoying our ocean view, Caroline came running up the steps announcing, “The tamale truck is here! Fresh, homemade chicken tamales for 12 pesos each!” I knew there was a grocery truck that came by several times a week, but I did not expect a tamale truck! There was also a dessert truck later that same day which lead me to wonder what other trucks there might be (A shrimp ceviche truck, perhaps? Oooh, or how about a fresh coconut ice cream truck?) We picked up four tamales and a little baggie of homemade salsa. Although we wanted to devour them on the spot, we actually saved our tamales for the lunch the following day. I steamed the tamales and then served them with the salsa and an avocado I had brought with me from Tulum. Golden masa filled with moist shredded chicken all wrapped up in a banana leaf – simple and delicious! Robert has always said that tamales are the perfect food. In this case, I think he was right. The foremost foodie restaurant in Xcalak has got to be Leaky Palapa. I had heard wonderful things about this place before our visit so I knew I wanted to check it out. In fact, I made sure to plan our trip so that we would be in Xcalak during the days that Leaky Palapa is open (Thursday – Sunday). Two of the other couples staying at Casa Carolina were planning on going to Leaky Palapa the same night we were, and Caroline called to merge our reservations with theirs so that we could all eat together. This worked out perfectly! Since there were six of us, we basically ordered everything on the menu and shared it all. Robert loves eating family-style, and I love getting to try as many different dishes as possible! Leaky Palapa’s menu rotates depending on what is fresh that week. Not surprisingly, the menu relies heavily on seafood and tropical ingredients. We started off with appetizers and a Caesar salad that was served attractively in a baked Parmesan cheese ring. Our entrées ranged from pork tenderloin crusted with huitlacoche to grouper with a tequila-lime glaze to “seafood a la nage” (mixed seafood simmered in a rich coconut broth). We finished the meal with bread pudding, mango and lime sorbet and a Oaxacan chocolate torte. Everything was very fresh and expertly prepared. The food all went so amazingly together that I really can’t name a single standout dish. Prices at Leaky Palapa aren’t particularly cheap, but sharing fantastic food with such great people made it worth every penny! On our last night in Xcalak, a bunch of us piled into a car and headed to Toby’s Restaurant for taco night! Toby’s taco night occurs every Friday and is a popular event in Xcalak. Toby is a friendly local who will come over to your table to introduce himself, tell a few jokes and explain how taco night works. It is simple: you have a choice between homemade flour or corn tortillas and a variety of fillings including beef, pork, chicken, fish and shrimp. If you can’t make up your mind, order mixto: one of each. Once you get your tacos, be sure to visit Toby’s salsa bar which offers up many different salsas as well as fresh sliced radishes and roasted onions. I ordered two shrimp tacos and two fish tacos. The food was all very tasty. The fish in particular was incredible; moist and super fresh. We had a blast at Toby’s. Not wanting the fun to end there, we decided to pick up some extra cervezas to take back to Casa Carolina with us. We sat out on the dock for hours, drinking beers with our new friends and watching the bioluminescent glow worms sparkle in the water below us. It was a perfect final night in Xcalak! Robert and I just returned from a week in the Yucatan Peninsula. The first stop on our itinerary was Tulum. Located approximately two hours south of Cancun, Tulum is known primarily for its striking pre-Columbian Mayan ruins. Tulum’s ruins are smaller than other Maya sites in the vicinity, but it is the setting – high upon a cliff overlooking the turquoise blue sea – that sets these ruins apart. Tulum also has beautiful white sand beaches making it an ideal destination for tourists. Long-time visitors will tell you how much Tulum has grown over the years. That may be true, but we still managed to find plenty of small town charm in the form of friendly locals, quaint sidewalk cafes and an unhurried pace. We stayed at Cabanas Copal which is probably best described as one step above camping. Copal’s rustic huts don’t have electricity and are very open to the elements. If the idea of finding a crab hiding out in your bathroom or bats sleeping in the thatches above you isn’t your idea of fun, you should probably look elsewhere. What Copal lacks in creature comforts (human creatures, that is) they more than make up for with their beautiful surroundings. Our cabana was located on a small cliff above a lovely, secluded beach. Imagine falling asleep to the sound of the surf and waking up to a beautiful Caribbean sunrise each day. Copal’s bar, set right above the beach, proved to be the perfect spot for sipping margaritas and Leon’s (Robert’s new favorite Mexican beer). I would skip the food, though; they offer pretty typical, uninspired beach cuisine. Fortunately, for us, there were plenty of delicious restaurants nearby. We ate breakfast twice at Trece Lunas, a little coffeeshop/art gallery located not far down the beach road from our cabana. It is a friendly, laid back place that is quite popular with tourists in the area. Although they serve lunch and dinner, breakfast seems to be the name of the game here. Breakfasts at Trece Lunas are tasty, wholesome and reasonably priced. I enjoyed the tropical fruit with yogurt and granola one day and eggs poached in “Trece Lunas sauce” (a spicy tomato sauce) another day. Robert had the chorizo scramble his first day and followed that up with French toast the next day. Their sandwich board boasts “the best coffee on the beach.” I didn’t try all of the coffee in Tulum, but I can report that the coffee at Trece Lunas was pretty darn good. If you are looking for a nice, relaxing place to start your day, Trece Lunas is a great choice. I’d recommend getting there early as we watched it fill to capacity on both our visits. Antojitos Dona Tere is a small sidewalk stand in Tulum Pueblo that specializes in masa-related snacks (antojitos means snacks in Spanish). Sopes, tacos, tostadas; they have it all. This place is popular with the locals so you may have to wait for a table (there are only three). Our waiter didn’t speak any English, and our Spanish is embarrassingly minimal, so we ordered by pointing at what the people next to us were eating. I later learned that what we had are called huaraches. Huaraches are flat, oval masa cakes that are grilled and then topped with various ingredients. They are named after the popular Mexican sandals that they resemble. At Antojitos Dona Tere, the huaraches come topped with refried black beans, cheese and your choice of one or two toppings. Robert ordered puerco (pork) and I had the nopal (cactus). I also ordered an agua de Jamaica (hibiscus tea). What a delicious meal! The grilled masa had an amazing toasted corn flavor, and the toppings were hearty and delicious. The accompanying salsa was very spicy; luckily they serve plenty of sour cream on the side which helps to cool the burn. The only downside was that the huaraches were a little tough to eat. I had a hard time getting my knife through the crispy bottom layer of masa. Something smaller that could be picked up, such as a sope, would have made things easier. Still, it was hard to find fault with this scrumptious meal. We stopped by El Mariachi for a beer one night and decided to return for lunch after hearing such wonderful things about their chicken tacos. Like Antojitos Dona Tere, El Mariachi is located in Tulum Pueblo. Eating in town, far away from the touristy beach zone, you get a better mix of locals and tourists. El Mariachi is a fairly large restaurant with an open kitchen where you can watch your food being prepared. The menu is extensive and features many typical Mexican dishes as well as a few surprises. Robert, naturally, ordered the chicken tacos. 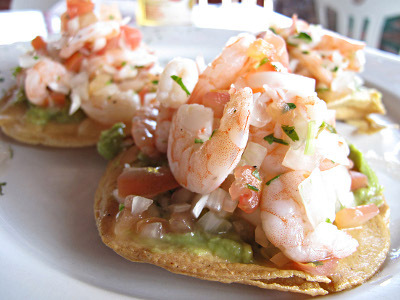 I opted for the tostadas de camaron: crisp corn tortillas topped with guacamole and fresh shrimp ceviche. The ceviche was very light and refreshing. With a chilled Mexican lager, the tostadas de camaron made for a near-perfect lunch. On our last night in Tulum, we headed out to El Tabano for a more “upscale” meal (upscale in Tulum terms meaning wear your nicer flip flops). El Tabano is located across from the Hemingway resort, a couple of kilometers down the beach road. The foodies on Chowhound rave about this place so of course I had to check it out. Despite being right next to the road, it has a very romantic, intimate atmosphere. The majority of tables are set in an outdoor garden. Twinkly lights and candles provide ambiance. The chalkboard menu is written in Spanish and features unique dishes inspired by Mexican ingredients. The staff are more than happy to discuss the menu and to help you choose your dish (which is a good thing since the menu is in a rather awkward location behind a couple of tables – to read it, you basically have to hover over some poor souls trying to enjoy their meals). We started off by sharing potato croquettes and a mixed vegetable salad. Robert had the pork in achiote: slow-cooked pork served in a rich, deep red sauce seasoned with just a hint of cinnamon. He described it as a cross between New Mexican carne adovada and a Moroccan pork stew. I ordered the camaron havanero: seared prawns on a bed of caramelized onions and tomatoes topped with a large dollop of some sort of spice paste. I have no idea what was in the spice paste, but its complex, sweet, spicy flavor complemented the juicy prawns perfectly. It was a delicious meal overall and a fantastic way to close out the Tulum portion of our trip! Upon arriving in Victoria, Robert and I immediately made a beeline for Red Fish Blue Fish. After our exhilarating seaplane ride, we were hungry for lunch and I had heard that this was the place to go for fish & chips. Red Fish Blue Fish is located on the waterfront just north of Victoria’s famous Inner Harbor. This friendly fish & chips joint is operated out of an old shipping container which has been outfitted with a tiny kitchen and a couple of windows where you order and pick up your food. The seating is all outdoors and consists of two counters with tall stools and a handful of low stools scattered about on the nearby pier. If all of the stools are taken, people are content to plop themselves down anywhere on the dock, the nearby rocks or even the street. Many seafood restaurants are supporting sustainable seafood efforts these days, and Red Fish Blue Fish is no exception. Their seafood comes from British Columbian waters and it is 100% Ocean Wise (Ocean Wise is a Vancouver Aquarium conservation program created to help restaurants and consumers make ocean-friendly choices.) All of the food at Red Fish Blue Fish is served in earth-friendly recyclable packaging right down to the compost-able wooden utensils. They don’t even have a trash can on site! The menu at Red Fish Blue Fish appears simple at first glance: fish & chips, fish sandwiches and fish tacos (called “tacones.”) Take a closer look, however, and you notice some pretty unique touches. 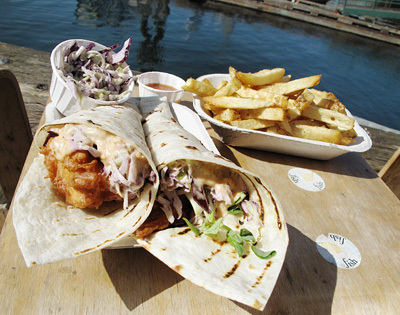 Standard fish & chips offerings such as battered and fried cod are offset by less common choices including BBQ Salmon, grilled oysters and seared albacore tuna. Inventive side dishes range from curry chips to tempura pickles to mushy edamame (their twist on mushy peas.) Fish tacones are topped not only with the expected cabbage slaw but also lemon-pickled onions and pea shoots. How often do you see pea shoots used as the greens? Our first day in town, we ordered two tempura cod tacones with sweet-smoked chili adobo sauce and a half order of fries. I knew the tacones would be good, but these went above and beyond my expectations. The presentation was beautiful first and foremost. The fish was crisp and light and the vegetables were fresh and crunchy. Robert particularly appreciated the fact that the tortilla itself was grilled. The fries were equally delicious, and a half order turned out to be plenty for the two of us. The next day, we tried the seared albacore tuna tacones which came with a spot prawn mayo instead of the adobo sauce. The tuna had a very clean taste with just a whisper of smokiness from the grill. It was bit chilly that day so we added a cup of chowder to our order. The chowder at Red Fish Blue Fish is sweet and spicy – nothing like the bland, floury tasting chowders you normally get in seafood restaurants. In fact, it reminded me a lot of my own Bolivian Corn Chowder. Red Fish Blue Fish was an unexpected highlight of our vacation. Not only is their food delicious, the waterfront setting is pretty unbeatable. It provides an excellent vantage point from which to watch the busy harbor traffic. We tried to go back on our third and final day in town, but they were closed. What a shame! Seattle could really use a place like this (Pike Street Fish Fry doesn’t compare.) Finally, as if our experience at Red Fish Blue Fish wasn’t good enough already, as we were sitting on the dock one day savoring the last few bites of food, we saw an otter climbing around on the rocks looking for scraps – so cool! Robert and I just returned from a weekend trip to Victoria, British Columbia. We took the seaplane from Seattle which was amazing! Viewing our beautiful Pacific Northwest from the sky is a unique treat. One moment we were waiting for our plane at Kenmore Air’s Lake Union terminal, an hour later we were checking into our hotel in Victoria. How’s that for convenience? Our hotel, the centrally located Magnolia, was also pretty fantastic. However, my favorite part of any vacation is eating! Highest on my list of restaurants to try was Cafe Brio. Cafe Brio is known as Victoria’s “foodie” restaurant so of course I had to check it out! It is located in a very unassuming area of town, just far enough away from downtown as to not be completely overrun with tourists. The setting is casual and comfortable. Customer service is impeccable - the staff is friendly and clearly very proud of the food being served. Cafe Brio is a bit pricey but well worth the expense if you like exceptional food and a unique dining experience. Cafe Brio’s menu is distinctive in several ways. A special fixed price menu is offered during the early seating (5:30 to 6:15.) This $29 meal includes appetizer, entrée and dessert and is a great value. Cafe Brio also has a relatively lengthy charcuterie menu. All of the charcuterie is made in house, and the menu typically features eight to ten items ranging from salami to summer sausage to pates. The meat cellar was reportedly stuffed to the gills with fresh batches of charcuterie the day were there, and our waitress was quite excited about it. Fixed price meals and house made charcuterie aside, my favorite thing about the menu at Cafe Brio is that every dish can be ordered in small or large sizes. You can go tapas styles and order a bunch of small plates to share or you can stick with a more traditional appetizer and entree approach. Robert and I love sharing food so we decided to order a selection of small dishes. We couldn’t pass up the house made charcuterie so we started off with gin & pancetta-smoked venison summer sausage. It was smoky and spicy and not at all greasy. Delicious! This was followed by a mixed greens salad topped with poached apples and the creamiest blue cheese I’ve ever tasted (undoubtedly a local cheese.) Other dishes included made-to-order chickpea tortellini served with braised greens and a delectable red pepper broth, the “contorni” plate – seasonal vegetables prepared four different ways, pan-roasted sablefish with scallop fritters, roasted squash, nettles and a red wine emulsion, and grilled pork loin served with a sausage and potato ragout and boudin noir puree. The meal as a whole was fantastic – my favorites were the venison summer sausage, the chickpea tortellini and the vegetable plate. We paired our meal with some of British Columbia’s finest: Quails’ Gate Winery’s Pinot Noir for me and, for Robert, the Driftwood Farmhand – a lovely saison style brew that was all the rage around town during our visit. While we were enjoying our meal, we learned that the table next to us was from Homes & Living, a magazine devoted to life in Central Vancouver Island. They were preparing to do a story on Victoria and Cafe Brio as part of their “weekend getaway” series. The getaway stories always feature an awesome island destination, a hot new car, fancy accommodations and an exquisite restaurant (the kind of lavish lifestyle readers of such magazines drool over.) The car of choice for this month’s story was a new 2010 Hyundai Genesis Coupe! The team made a big production out of trying to get a perfect photo of the restaurant with the car parked out front, providing us with plenty of entertainment in the process. Robert enjoyed getting a sneak peek at the new car while I was content to swoon over the delicious food in front of me – a perfect night out in Victoria for the two of us!